Showing results for tags 'impreza'. Sorry if this has already been a thread before, but i recently got picked up an 07' Impreza S-GT, 2.0 Turbo 5 Speed. Excellent car and I'm having a blast driving it. Anyway, the car has just under 170000 k's and I believe it's time for me to do a service - oil, filter, etc. What are some other things you guys generally do when servicing your turbo Subaru's? I was having a gander at servicing videos and the general service seemed to include cleaning the AFM, resetting the ECU, and top engine cleaning? I feel like some of it is a bit unnecessary but and pointers are greatly appreciated. I feel and oil and filter change would be sufficient enough? 08’ Impreza 2.0R manual, 214xxx k’s. I have had the car for about a week and I’ve noticed when driving it that the car has a slow/flat/sluggish spot around 2000 until 2500 rpm where it struggles to accelerate. The revs kind of fluctuate up and down around and it slowly climbs until it hits around 3k rpm and it accelerates fine. Some days are worse than others, sometimes it happens, sometimes it does not. My first guesses are are spark plugs and leads or something wrong where it’s starving it from fuel? Maybe a fuel pump or the likes of. Any ideas?? Thanks guys. 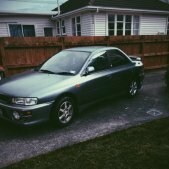 Hey team Ive managed me score myself a nice deal on a new daily driver which is an 08’ Subaru Impreza 2.0 Manual. Super nice car for the price and really my first decent car that I’ve owned. I’m looking for advice on lowering the car at some stage, what sort of route to take, easy and sensible options for this car. I was wondering is struts and springs from a WRX or S-GT from the same era would be an idea? I reckon these cars look super nice on a decent set of wheels and a wee bit lower to the ground. Correct me if I’m wrong but the stud pattern for the wheels is 5x100? Could anyone advise me on the offset of the wheels, etc for when buying aftermarket wheels? I’m not that clued up on them. and for anyone who has owned the same sort of car, what are some general modifications you did to the car to improve anything from basic engine performance, driveability, servicing, and general things I should keep and eye out for, whether it could be problematic or not? Any help is appreciated Cheers. Hey guys so recently my newly-bought WRX refused to start and the garage I got it towed back to who installed my alarm - have diagnosed it as a fuel pump issue. I'll need a new fuel pump put in. I just want to know if a quote of $550 is a fair price or am I getting ripped off? At the time of the fault I would have had the car for less than a month and I would have done less than 1000kms in it lol. So I'm preparing for a motor vehicle disputes tribunal case.. as a former employee of mvdt I think it could get to that stage. HELP! EJ205 Impreza wrx hose going no where! Hi there, sorry for the noob questions but my wrx with an ej205 has a hose in the engine bay that goes no where, just wondering if anyone has any ideas, cheers. The picture was too big for the forum so here's a link to my question on facebook. Hey guys looking for some advice here. yesterday i parked my un-warranted Sub on a public road in wellington, and got absolutely destroyed with fines. $200 for: Operated an unlicensed motor vehicle-parked vehicle and another one issued at the same time for: No evidence of vehicle inspection also $200. now i have heard that i could write a letter saying that i am a poor student and provide evidence that i have now got a warrant and possibly get the fine waived or i could go to court but i am not sure what the costs or risks are involved with doing that. any help would be greatly appreciated cheers.